Do you all know the saying “It’s easier to ask for forgiveness than for permission?” Well, Alex can be glad that Chuck doesn’t seem to have heard of that one yet. Or maybe he has, and Alex just knows she really has to keep an eye on her keys! b) die being beating to a pulp before being set on fire by the owner…. Not sure if I’m not reading his posts right. An attempt at humor maybe? One thing is for sure though, we will NOT make this our final strip! Why are you so angry, KenH? Mike, I don’t get KenH, either, but I think as a fellow German native speaker maybe I don’t get this kind of humor. 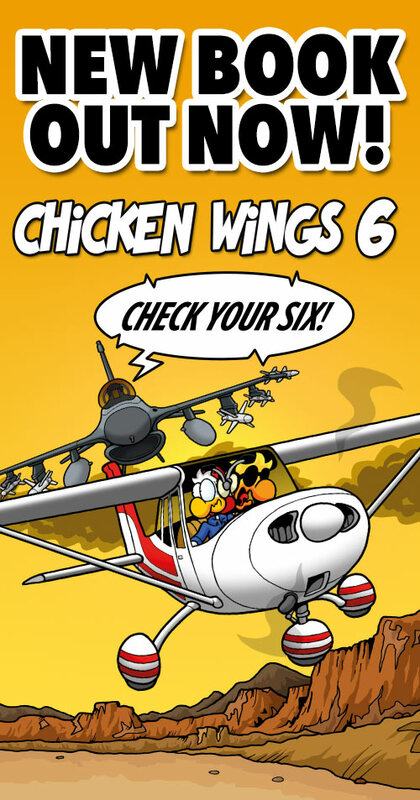 Overall, Chuck can’t be that bad of a pilot. Sure, he occasionally bends some metal, and some rules, messes up on the radio, and his landings are, more often than not, the three-for-the-price-of-one kind, but he didn’t have a fatal crash. As someone who loves working movie quotes into every day conversation, this is a fantastic strip. Looks like we have Jerry Maguire, Notting Hill, Star Wars, and, one of my all time favorites, Dumb and Dumber. A hundred points go to Denton! Ding ding ding ding! I agree, Chuck might mess up a lot, but that’s what makes the strip funny… And he hasn’t won a Darwin yet.